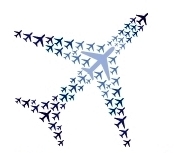 Yesterday was a great day for travel related deals, including some awesome mistakes fares. Here are some of the big deals from yesterday, some of which lasted only a few hours. Unfortunately, if you read this blog and only this blog yesterday, you didn’t see any of these deals (I’m a bad blogger for it, I know). However, I did post about all of these deals on Twitter (or at least retweeted them). See below. Quite simply with my day job, I don’t have the time or ability to create even a quick post about many of the deals that come up and literally last only hours. If I wait till I get home to post, the deal will most likely be dead. However, I do try my best to post these on Twitter as it can take literally one second to retweet a deal (with a link to get more info) as opposed to typing up the same information. You can even have a text sent to you with my tweets – here is a handy guide on how to set that up. 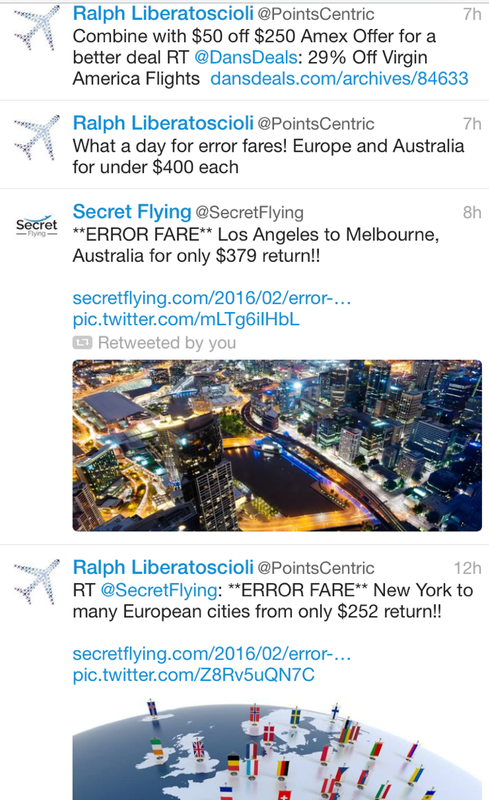 So in short – follow me @PointsCentric as I tend to post more deals (especially short lived deals such as error fares) on there as a lot of them do not make it on the blog.